I hope everybody had a merry Christmas, where applicable. Mine was nice. I slept on my mom’s couch and watched Mythbusters for a few days, so there you go. I’m back now, though, to review yet another book that I wouldn’t have looked twice at otherwise. Well, I fib a bit on that one. See, I’m doing something special for the new year crossover, as well as the anniversary of me starting up this blog. Can you believe I’ve been at this for two whole years? I can’t. It’s insane. I’ve never stuck with a project even remotely this long. To celebrate, I’m doing not one but two Penetrator novels in a row. They’re from an omnibus edition that I’ve had sitting around for a while. See, the reason this particular edition would have caused me to look twice is because of what the spine says. I scanned it so you can see for yourself. It’s unbelievable otherwise. Yes, I have the sense of humor of a child. That’s okay. A few things are noteworthy about this omnibus edition. For one, it doesn’t say anywhere where these two books lie in the Penetrator sequence of events. I had to look that up myself. Second, the author byline states “Chet Cunningham” instead of the usual Lionel Derrick. Chet is on record as being one of the two people to use the Lionel Derrick house name, and he did all the even-numbered Penetrator books. These two are, in case you were wondering, numbers 10 and 12. This means that one gets skipped in the meantime. That would annoy me, except #11 is Terror in Taos, so we aren’t missing anything. Good. I have to wonder what led to this publication and Chet getting the credit. 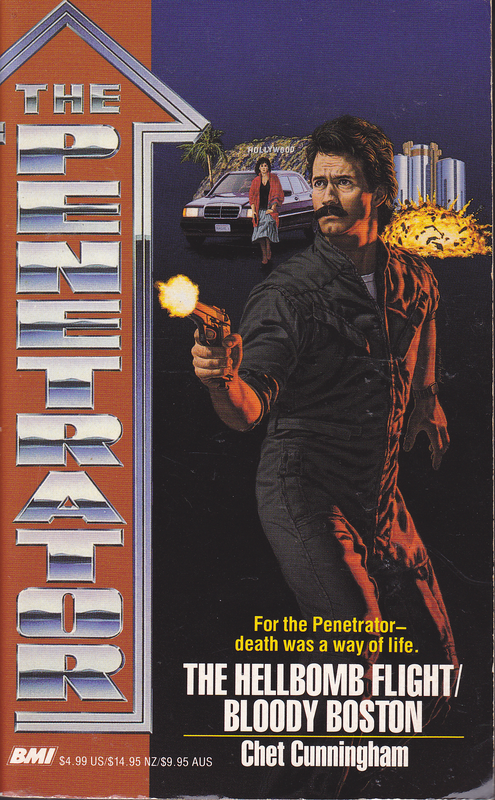 There are two more Double Penetrator compilations, both of which also have Chet Cunningham books in them. Mark Roberts kind of gets the shaft here. I wonder if Chet (who has a lot of non-Penetrator books floating around out there) decided he could afford to buy up the rights to the ones he wrote and republish them under his own name. I wonder what led to that decision. I can’t find any reference on the publication page to when this omnibus was released. The cover makes it look, well, 80s. Mark’s trademark pencil mustache is replaced with something a little bushier. He’s wearing a wristwatch. I don’t know about you, but I never imagined Mark Hardin wearing a watch. He wouldn’t need one. We know this from the text, this isn’t just me being goofy. It’s been stated several times that he has a perfect time sense. He can even set a mental alarm clock that will wake him up right on time, all the time. A watch would be a liability. Also, is he wearing a jumpsuit? I don’t like anything about this cover except that the licence plate on that car reads “ANGIE X.” That’s what it looks like to me, anyway. Since Angie is the closest thing to a steady girl Mark Hardin seems to have, that’s a neat reference, except that we don’t meet Angie until book 29, Aryan Onslaught. Deliberate? Coincidence? Who knows? This book starts hot on the heels of the last one, Dodge City Bombers. In keeping with previous reads, the book begins with Mark recuperating from his last adventure, considering retiring from the business, and being called in to this next adventure. We jump to some guy on the run from another guy who has a gun. This guy was involved in the plot that makes up this book, but he decided he wants out. The guy with the gun is playing cat-and-mouse with him in a cruel fashion. We learn that the guy is a computer programmer, and I only bring it up because it’s so wonderfully dated. This computer programmer is thinking about how he got into this mess and how the pay he was offered, $15,000 over the course of six months, was just too good to be true, even for a programmer of his skill. This dude was flipping out over the promise of $30,000 a year. Amazing. This book focuses on the bad guys a bit more than I expected. It seems that Dr. Orlando Fitzmueller, formerly of NASA, has a plan. He wants to hijack a Russian satellite filled with weaponry and hold the world hostage with it. He backstory involves being convinced that the Russians are not backing off on their weapons in space the way their treaty with the United States would have dictated they do so. He brought this to the attention of his superiors and was dismissed from government service for his efforts. Now he plans on proving himself right, all the while demanding that the world disarm from all nuclear weaponry. He thinks this will shepherd in a new world of peace. This is the most idealistic villain The Penetrator has yet to face. And yet most of the book doesn’t have Mark facing off against this guy at all. Mark spends most of the book tracking a few leads that don’t get him much of anywhere, all the while shacking up with a lady he met in a previous book. She’s named Joanna Tabler and she works for the government in some capacity, I don’t remember if it was for the FBI or the DOJ or what. All we learn about her is that they met during the “Hijacking Manhattan” incident (verbatim the name of the fourth book), she used to be a model, and she’s stone cold foxy. Together, they don’t get much done in this book except for each other. Another lady in this book turns out to be Dr. Fitzmueller’s daughter, Hillie. The good doctor, in internal monologue, makes it clear that he’s doing all this “for her.” She’s a college student. Mark meets up with her at one point and demands that she tell him where her father is. She insists that she’s not involved and that she doesn’t know what he’s talking about. In the end, though, she uses her feminine wiles (read: she takes off her shirt) to try to distract Mark, but it doesn’t work. He’s too professional for something like that. While she’s going through these motions, a goon tries to put a bullet in him, but Mark notices this right at the last minute and kicks him in the head so hard his neck snaps. It seems that the Mafia is also tied in with this scheme, because of course they would be, but Mark overestimates their involvement. It just seems to go as far as Dr. Fitzmueller hiring some Mafia goons to help with guard duty. The guy with the gun at the beginning, Marshall Davis, is one such goon. The Mafia connection leads Mark down a few dead ends, but in the meantime he blows up a building just because it’s a Mafia barracks. It was pretty great. Dr. Fitzmueller gets a lot farther along in his plan than I’d expected, as well. He does, in fact, capture the Russian satellite. He’s convinced that it’s got nuclear weapons on board, but later events show that it’s some kind of virus that could kill off all life on Earth. No matter, it’s still good for holding people hostage. He makes his demands known across AM radio (hahahaha) and the government has to react. The clock is ticking. But wait, something goes wrong for Dr. Fitzmueller! This was the part that surprised me most. There’s a coup and the Mafia guy, Davis, takes over. See, though the whole book he’s been asking questions about getting more money and how much money will there be and when’s the money going to be here and all that. He’s convinced for most of the book that this is just a typical hostage thing where money is involved. Dr. Fitzmueller never says anything to convince him otherwise until the demands are met. Fitzmueller’s idea of “reward” for all his lackeys is, in fact, a world of peace. Aww. So Davis throws Fitzmueller in a closet and makes his own demands. Lots of money, diamonds, gold. All that jazz. He gets in contact with the Mafia and tells them they can have a cut if they send some soldiers to keep an eye on the place. This led to something that amused me. See, up to this point Mark had no idea where Fitmueller’s hidden base might be. All he knows is that it’s in the Utah desert somewhere (the whole book takes place in and around Salt Lake City). At one point he caught a glimpse of a helicopter that was involved in the operation, so being Mark Hardin he memorized everything about it and collected some information and then just sat at an airport waiting for it to come back so he could follow it. Not a bad plan. What’s funny, though, is that Fitzmueller, before the coup, made an order that the helicopter wasn’t to fly out anymore. He didn’t want anybody to follow it back to the base after the demands were made. He’s a pretty clever idealistic villain. It looks like Mark is just wasting his time. But the first thing Davis does after he takes over is send out the helicopter to pick up the Mafia soldiers and bring them back. That’s what gets Mark on the trail. Part of the demands Davis comes up with is that the delivery of valuables would also have to include a plane full of women and children. Mark, as he comes up on the place where the delivery is to be made, shoots out the tires on that plane. I’m not certain what that was supposed to accomplish. After that, though, he fights his way into Fitzmueller’s compound. What’s interesting about all this is that there are something like thirty pages left in the book. All of the action is back-loaded, with a few exceptions. Mark does what he does best over those next thirty pages, shooting people, strangling them, and so forth. It’s not as gory as usual, and there aren’t any little backstories that set up a goon’s motivations before he gets brain-smashed. Those might be from later books, or they might be something more along the lines of Mark Roberts’s writing. There is a reference to a neck snapping like a twig under a Clydesdale’s hoof, so that’s pretty great. It’s about as quick and simple as you’d expect it to be. Dr. Fitzmueller surrenders to Mark after Mark points out that his daughter is a pretty young thing and that he knows some “white slavers” who might be interested in her until they “wear her out” in “three to six months.” I don’t know if that was a reference to an earlier book (one seems to deal with white slavery and Vegas showgirls, according to this list I found) or if was just a threat. It wasn’t an idle threat, though, I can tell you that much. If anybody knows how to brutally demoralize a person, it’s The Penetrator. Fitzmueller sets the satellite on a collision course with the sun so that no one could ever use it for evil again. Not a bad resolution, although I’m not sure how well that would work. I don’t think most satellites would have enough fuel and/or thrust to make it out of Earth orbit. Mark stops a helicopter full of money from making it to Mexico. I believe he uses a sniper rifle of some sort. I don’t know if Davis was supposed to be on board that helicopter, and in fact I don’t recall seeing him die or escape at all. I wonder if he shows up in a later book. Whatever the case, Mark heads back to Joanna for some more sexytimes, talks to her boss on the phone who reveals that they never gave up any of the demands (it was lead bars painted gold, for example), and everybody is happy for a while. Not the best Penetrator novel by any means, but a good one. Oddly enough, even though the plot involved taking over a Russian satellite and holding the world ransom, it had one of the more down-to-earth plots of the ones I’ve read. And it wasn’t even all that evil, at least at first. Dr. Fitzmueller’s heart was sort of in the right place. He just wanted a safer, happier world for everyone, including his daughter. It’s hard to dislike a villain like that. I do wonder how likely he was to blow up half the world if his demands weren’t met. He just didn’t strike me as that kind of villain, which takes away a lot of the oomph. Maybe Chet Cunningham felt the same way, which was why he had the Mafia coup take over the whole operation. It upped the stakes, especially since Davis was presented as a stupid person who was more than willing to do some terrible things for money. The book had one of the less likable female counterparts in the series, though. We’re told that Joanna is capable and a skilled agent of whatever she does (and I think we get her doing some stuff in the book where Mark first met her), but in this one she’s window dressing, something for Mark to come home to and maybe bounce a few ideas off of. I would have liked to see her get into the action a bit more, or pitch some ideas of her own around, or something. She was a little bit flat. Mark still doesn’t use much in the way of his Cheyenne powers, although his mentor, David Red Eagle, has a bit more prominence in this plot. We get a pretty extended training montage early on. So yeah, this was a fun one. Next week (next year!) I’ll do the other half of this omnibus, the unfortunately named Bloody Boston. In between these two books is #11, Terror in Taos, so if you’re new, check that one out before next week. Before long I’ll have knocked out this entire series, assuming I can find them.